Usually I write about the kind of art that you see in galleries but today I want to show you this book cover by illustrator Andy Potts, which I think is particularly clever. Not only are the colours wonderful, the purples, reds and oranges, it is shiny in all the right places and I also like the way that the ideas are layered. The book is both exciting and funny. See this review by Mr Ripley’s Enchanted Books .Andy Potts has captured this brilliantly in the cover. The children look heroic which they are. If you look closely you will see that the shape down the right hand side is the Goldfish and its eye is formed by the head of one of the children. In real life, it looks even better, shinier and brighter than it does in this picture. Oh, and you may have noticed that the book is by Sophia McDougall. That is no coincidence; yes she is my daughter, the very same that I painted in Sophia Writing in Striped Socks. Mars Evacuees is what she was writing. The book is published today. It is aimed at children in the 8 to 12 age bracket. Many adults will enjoy it too. I did, though it was a somewhat tantalising experience as I was only able to read it a chapter at a time as it was written, which took over a year. I’m now reading the sequel in the same way. 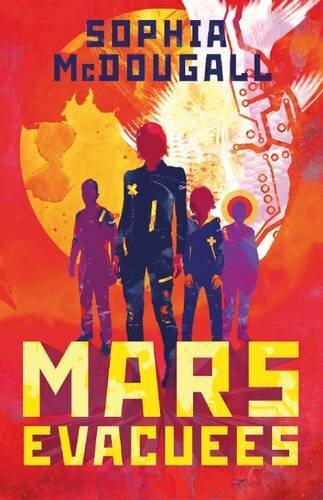 “Haven’t you got any Mars for me to read,” is my normal question when we meet. If you have a boring train ride or the flu, and want a book that is exciting, that will make you laugh and cheer you up – I really recommend it.